Craft Beer Education Camp gives craft beer aficionados around the world the opportunity to experience a nine-day version of SDSU’s popular Business of Craft Beer program in one of the finest destinations on earth — San Diego, California. Since its debut in 2016, the camp has drawn students from around the world — Canada, Columbia and the U.K.; to Venezuela, Australia, and Argentina, and all points between. See their rave reviews in the blog stories featured on the left rail. Cheers to an unforgettable, international experience. Craft Beer Education Camp is on hiatus, with a return date to be determined. Until then, craft beer aficionados can take their career to the next level with SDSU’s Business of Craft Beer program, taught by the same instructors — a who’s who of local craft beer experts — who made our Craft Beer Education Camp world renowned. Everyone welcome; must be 21 or older. Maximum of 40 students per session. For additional information, email craftbeer.ces@sdsu.edu or call (619) 594-3946. 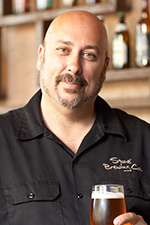 Craft Beer Camp is separate from the Professional Certificate in the Business of Craft Beer. Should you decide to pursue the professional certificate, CB 004 - Brewery Start-Up I will count toward your certificate.